Hearts new boy puts all thoughts of resurrecting his Scotland career to the back of his mind to concentrate on Jambos. 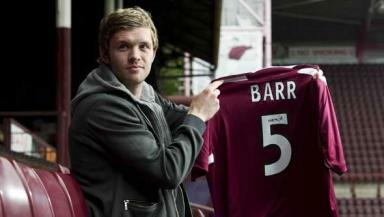 Darren Barr says he has only one thing on his mind this season: establishing himself in the Hearts first team. Barr has been capped once, by former Scotland bossGeorge Burley against Northern Ireland in 2008. But Jim Jefferies first signing for the new season quickly dismissed suggestions that the move to Gorgie could help boost his chances of returning to the Scotland fold, preferring instead to focus on doing a job for Hearts. He told reporters: "The only thing I'm concentrating on is Hearts. Whatever happens after that happens. "I just want to get my head down and concentrate on Hearts and keep focused. Whatever comes is a plus. "It's all about Hearts at the moment. People can ask me about Scotland but it's not about that, it's about starting fresh at another club and kicking on." The 25-year-old defender signed a pre-contract agreement with the Edinburgh club in January after his contract with relegated Falkirk expired. Despite being safe in the knowledge that he would be plying his trade in the SPL next season, regardless of whether Falkirk were relegated or not, he says the experience of failing to beat the drop has made him all too well aware of the opportunity he’s been given at Tynecastle, And he intends to grasp it with both hands. He added: "It's been a long-time coming so I'm definitely looking forward to it," he told HeartsTV of his move to Tynecastle. "After the season I had with Falkirk, which was very disappointing, I'm just keen to kick on with Hearts. "It was an eventful season and I'm a bit disappointed with how it went for Falkirk but knowing I was coming here was a good feeling. My future was sorted and I could get on with things. "I spoke to Elvis (Steven Pressley) about stuff and he has helped me out a lot as well. He was very positive about the club and everything as whole." In his bid for success, the versatile utility player who can play centre-half or right-back admits he’s happy to play wherever Jambos boss Jim Jefferies sees fit. "I've been at the other end of the scale when I've not actually played so wherever the manager wants to play me I'm happy to play there. "I just want to be a part of the team and hopefully I can just keep my head down and keep working at it." The former Falkirk captain also found time to praise Hearts other close season signing so far- former Killie hit man Kevin Kyle. "We've had a few tussles which have been good, “he said of the 29 year-old striker. “He's a very good player so I'm looking forward to playing alongside him."